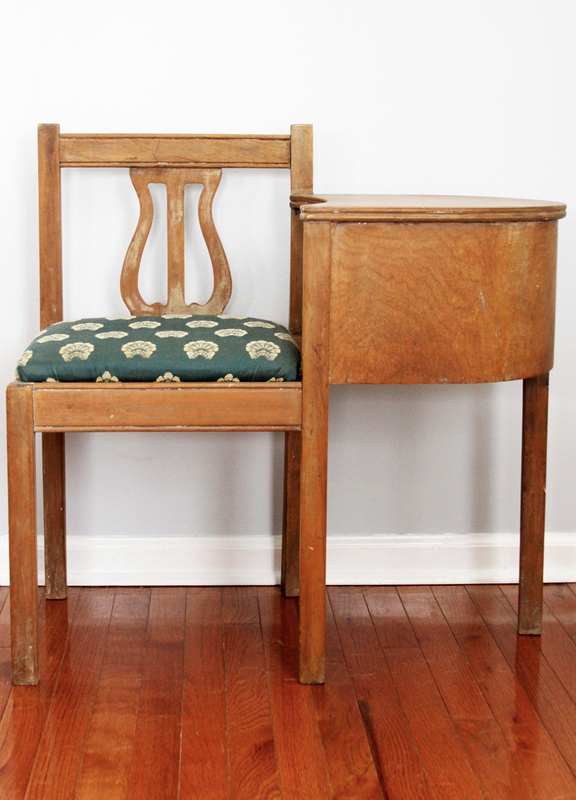 I can’t resist sweet little vintage furniture pieces. My house is starting to look like an antique booth! A few weeks ago I found this darling little gossip bench, and I just fell in love. She was a little sad looking, with her chippy stain and dark green seat cover. 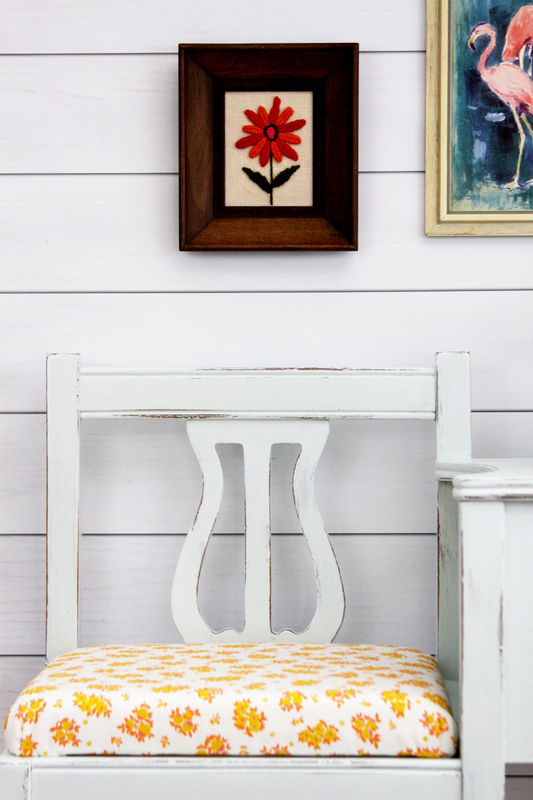 But she was the perfect project to try out Plaid’s new FolkArt Milk Paint line! So much better right?? I am really in love with this light turquoise color. It’s a little hard to tell in the photos, but in person it’s just the perfect shade of light minty blue. The table is nice and tiny too, so it makes just the sweetest little spot to sit down and read a book. I can just picture some sweet gal sitting her and chatting on the phone with her friends. Now I think I need to hunt up a pretty pastel vintage phone! 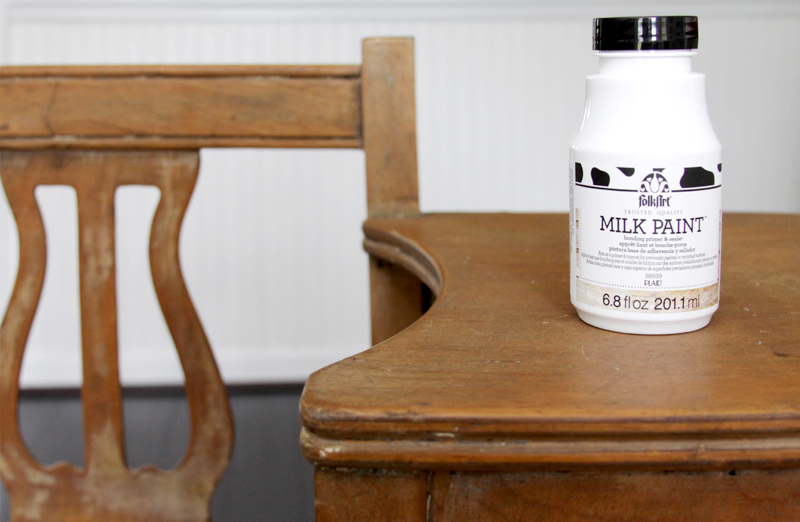 This FolkArt Milk Paint is a new product from Plaid. I didn’t have any experience with milk paint before, so I had to look up what the differences were! 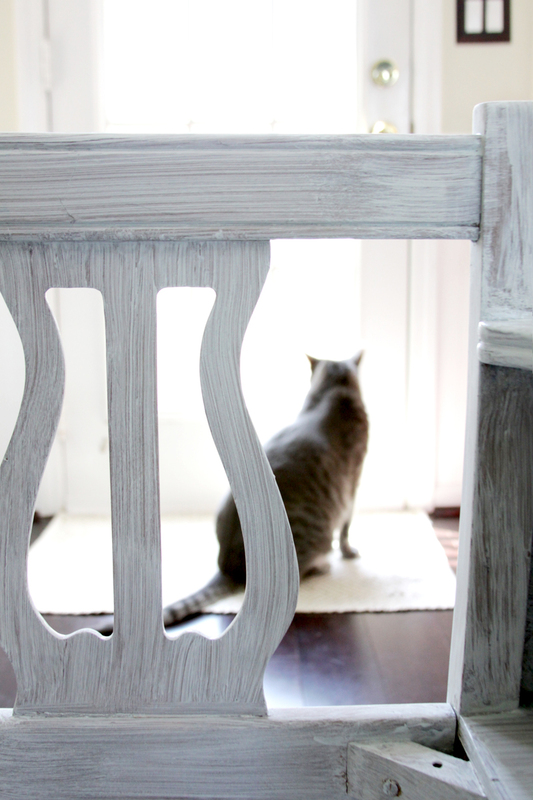 Milk paint is just amazing on unpainted wood and refinished pieces. 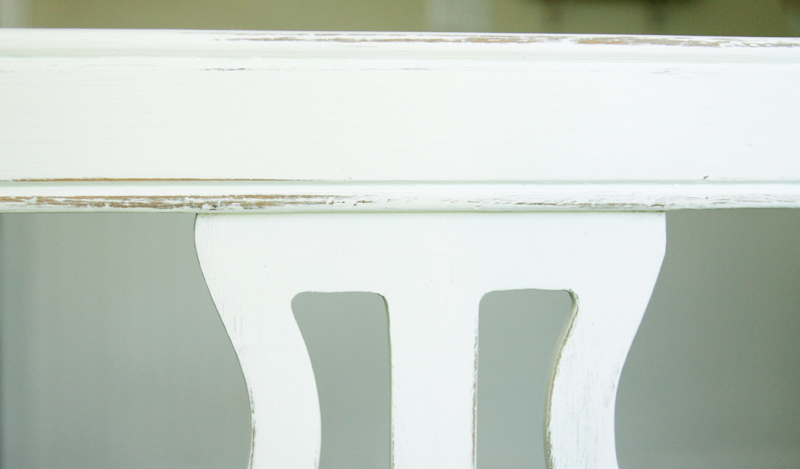 Milk Paint is usually something you have to mix up, and it can actually go bad! But Plaid’s new paint is already premixed and it won’t go bad. Yay for that! 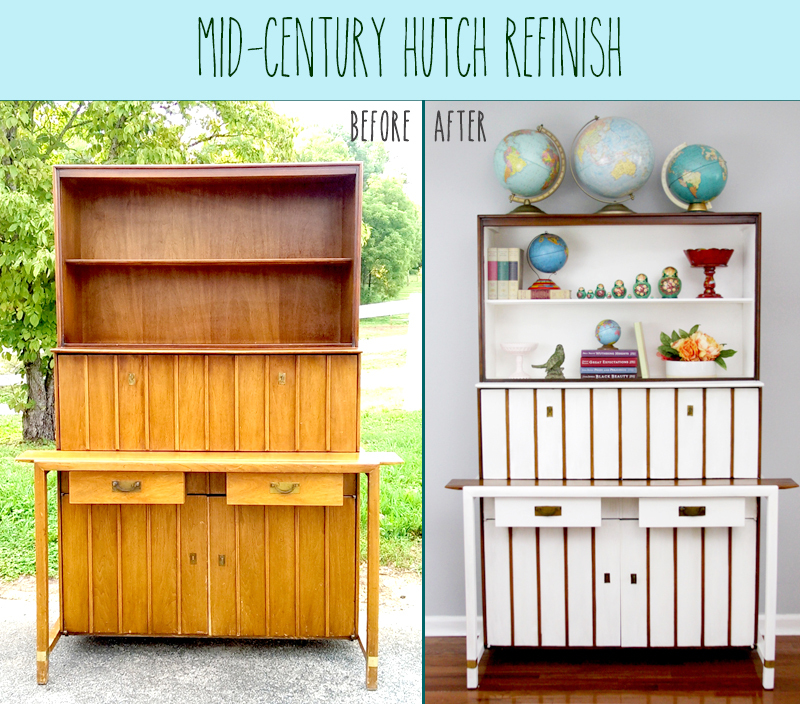 So let’s dive right in and I can show you how I refinished it! I started by taking off the cushion. I didn’t do any sanding, with a vintage piece you don’t have to unless it’s not in good shape. I just did a quick cleaning with windex, to get the spiderwebs and gunk off. 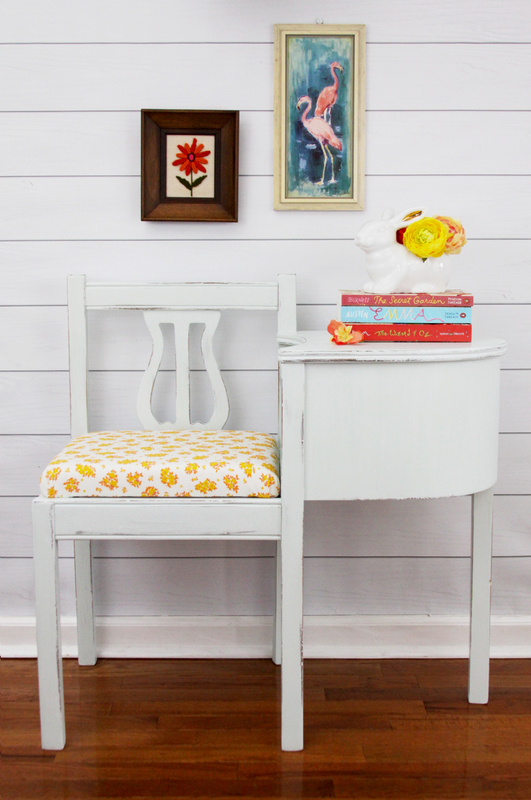 For refinished pieces you want to cover the whole piece with the FolkArt Milk Paint Bonding Primer and Sealer. Brushing this on makes it so the paint will adhere to the piece really well. I tried to show the before and after of the bonding primer – the right side of the piece has been primed. It looks kind of milky when it goes on, but it dries clear. Now you’re ready to start painting! 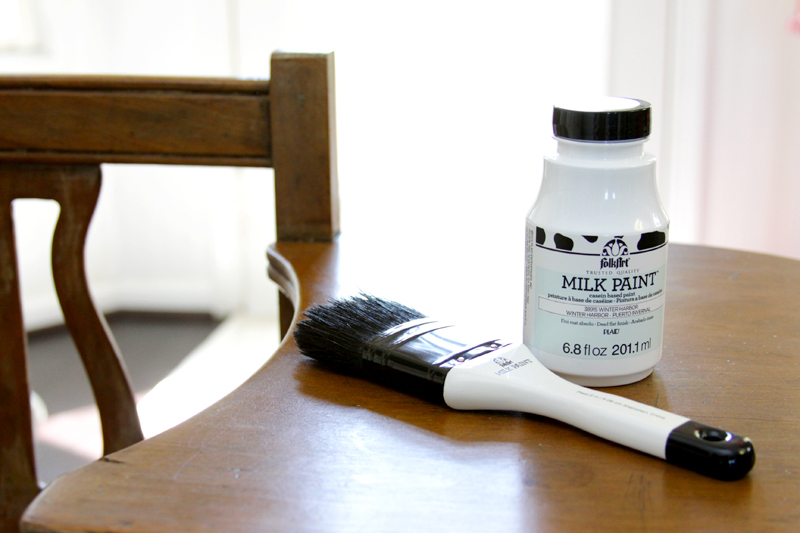 Make sure you use the FolkArt Milk Paint brush when you paint – it’s designed specifically for the paint, to keep the brush strokes down and hold more paint. The color I used was Winter Harbor. I love it so much! You’ll have to kind of play by ear how many coats you do. I wanted a pretty solid coverage so I did 4 coats. 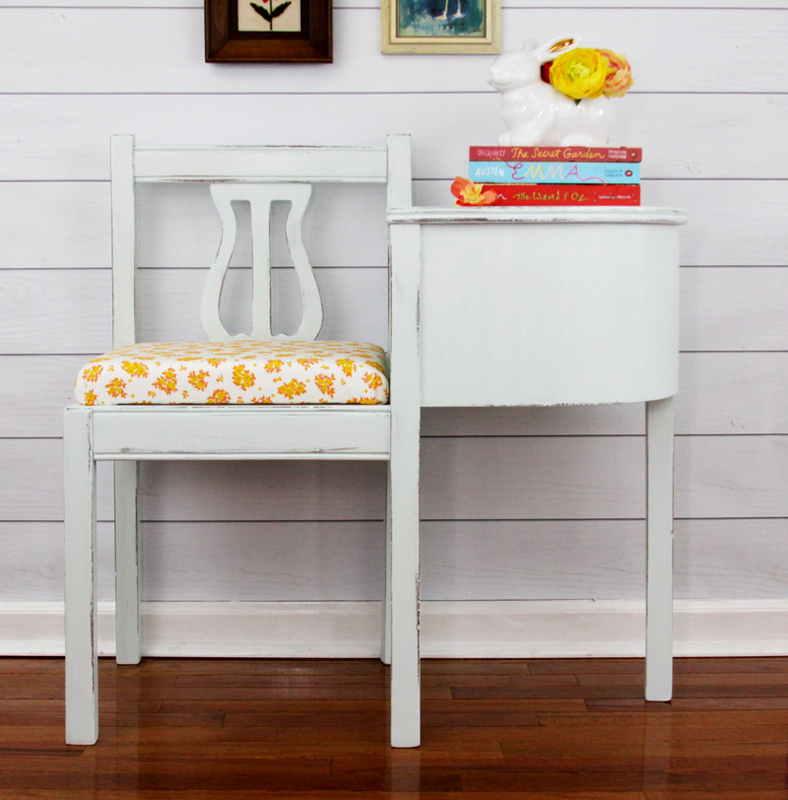 Milk Paint kind of goes on like a stain – on raw wood it really absorbs into the wood. For this piece, I used up almost two bottles of the paint. Here’s the first coat. You want to try and brush on the paint with the grain. The first coat is kind of a mess, because you can see so much of the original finish through, but each coat gets better! Here’s my bench after four coats. I did a little light distressing on the piece as well. 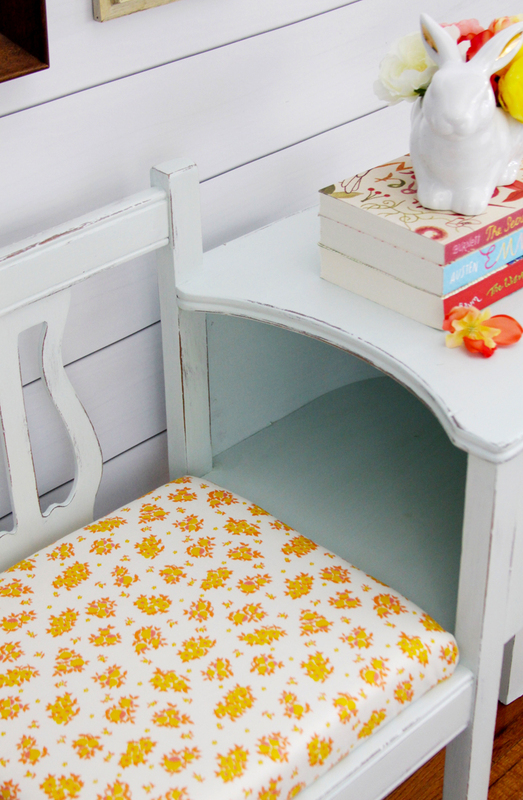 Distressing with the milk paint is super easy. 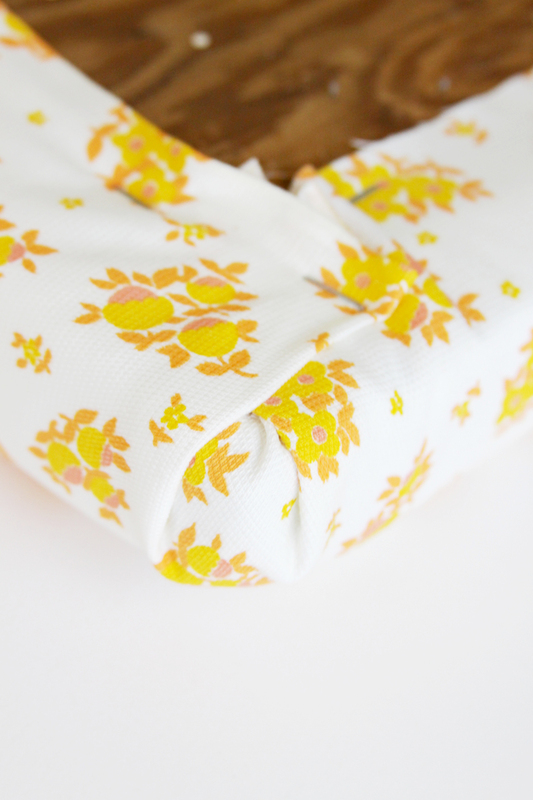 Recovering a cushion like this is super easy! 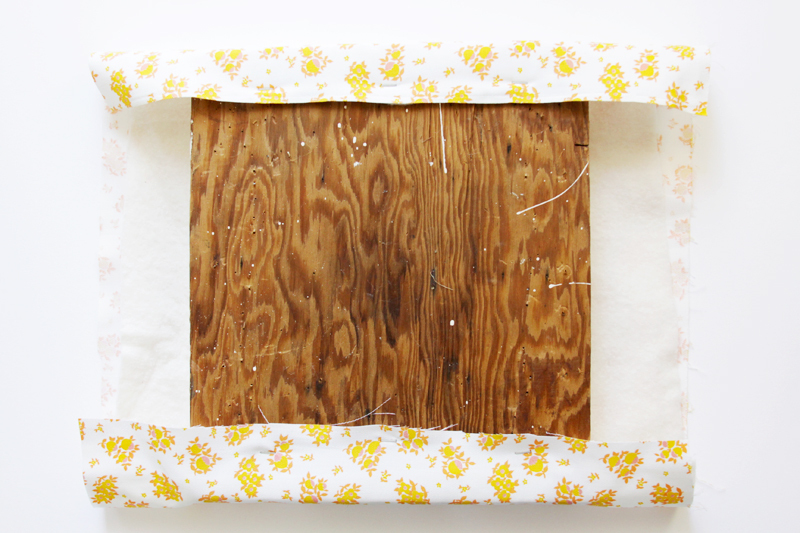 I started by removing all the existing fabric. 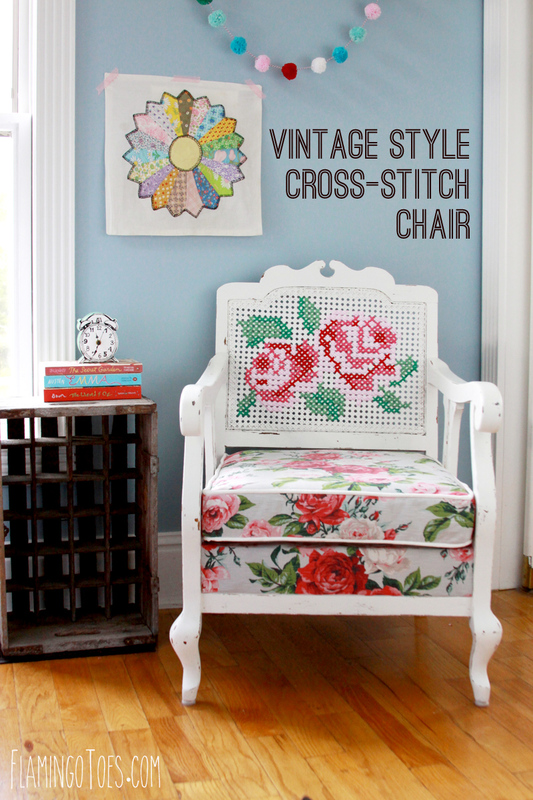 The cushion on this was actually buried beneath four layers of fabric and was an old chair pad . . with ties! You want to cut a piece of 1″ foam the same size as your wood, then a piece of batting about 6″ larger than the wood base. 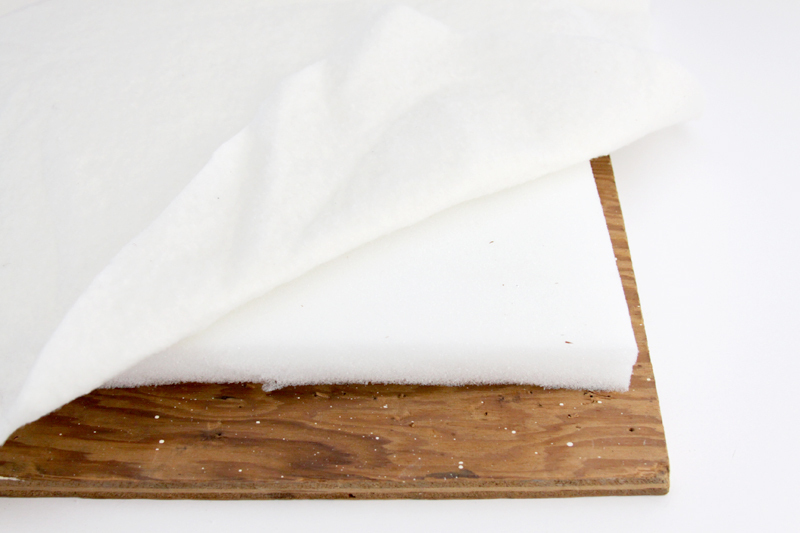 Layer the foam on the wood, then the batting on top. Cut a piece of fabric just a bit larger than the batting. 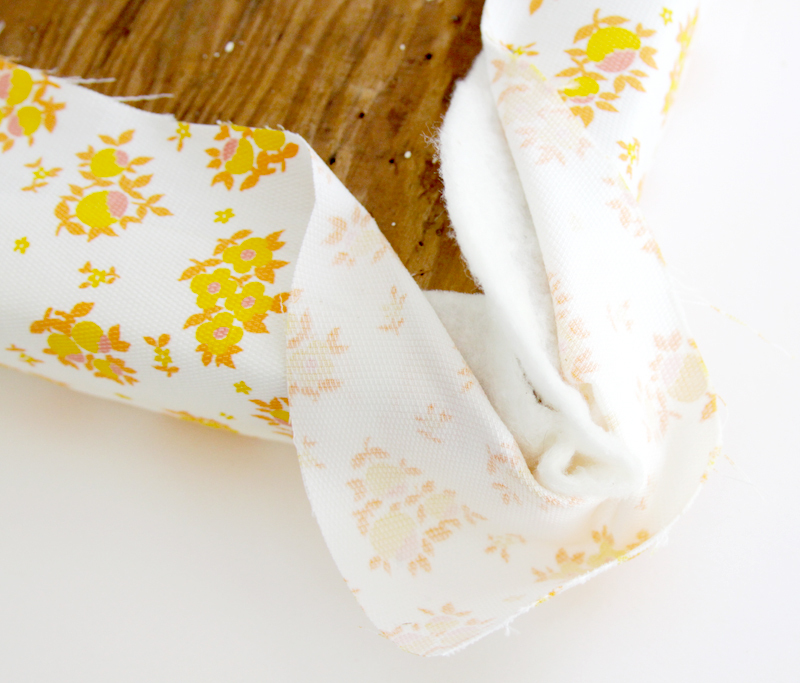 I used this fun vintage fabric! Bring the fabric around to the bottom side and staple down the two sides first, pulling the fabric tight. Repeat for the other two sides. For the corners, trim out the batting so it’s not all bulky. 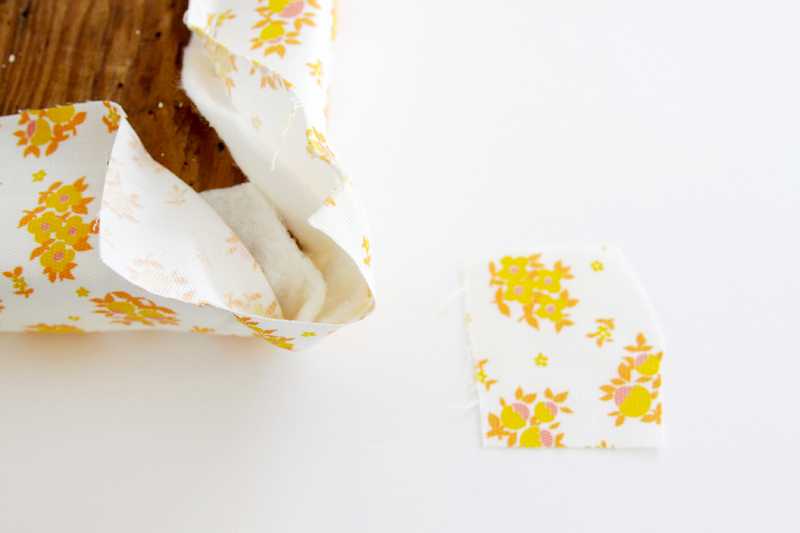 Clip out a square of the fabric as well, so there isn’t a huge lump of fabric on the bottom. Fold the center in, then overlap the two sides, to make a kind of box pleated corner. Staple down. Now your cushion is all ready to go. 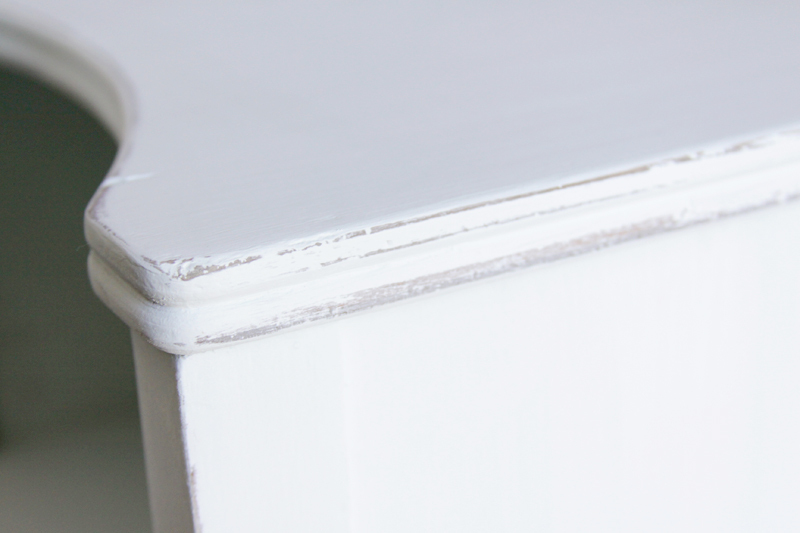 Once your paint is all dry and distressed, clean off all the sanding dust. 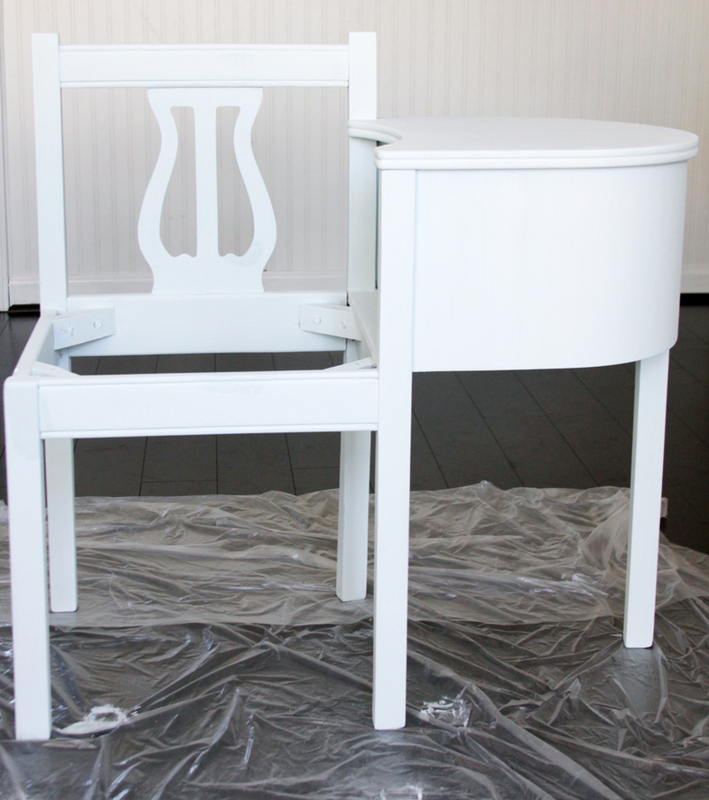 Brush a coat of the Bonding Primer and Sealer over the piece to seal the paint. Put the cushion back in place. And that’s it! So easy right?! 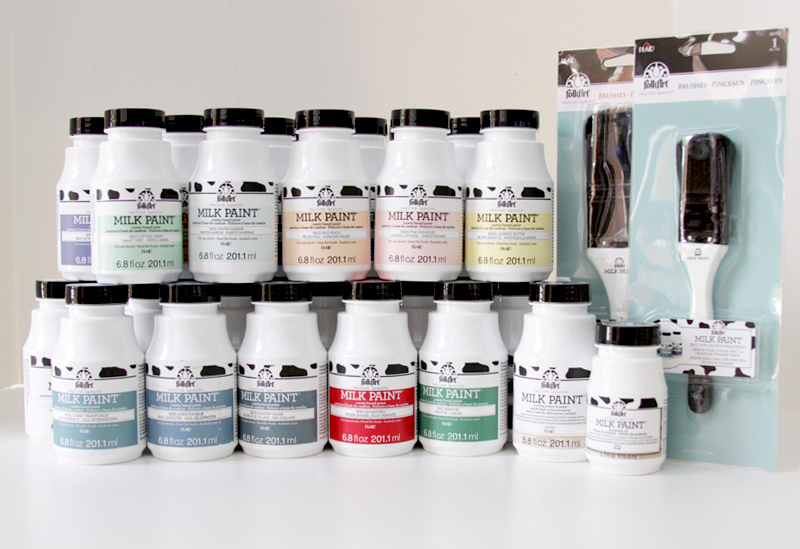 You’ll be able to find FolkArt Milk Paint plus all the Primer, Finishing Oil and Brushes at all the major craft stores. You can also find it on the Plaid website! Oh gosh, so cute! 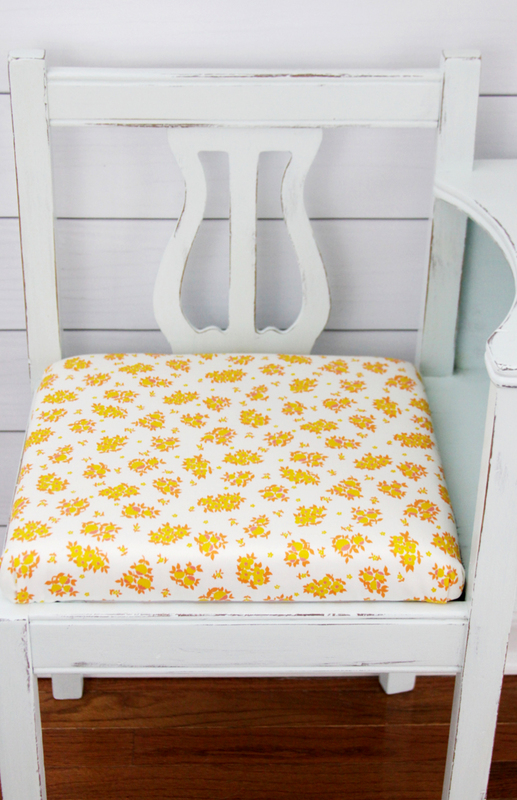 I absolutely love the fabric you used for the cushion…so sunshine-y! Also, if you could find a pink phone to set on the desk, it would be perfection. Too cute! We had one of theses “telephone tables” in our home growing up. It was at the base of the stairs. I have never heard of it being called a gossip bench, but it’s a perfect name. You really scored big on this find. I have not seen one of these in years. Great makeover! Super cute the paint is gorgeous. This turned out really well – such an interesting piece! I’ve never seen a ‘gossip table’ lol. 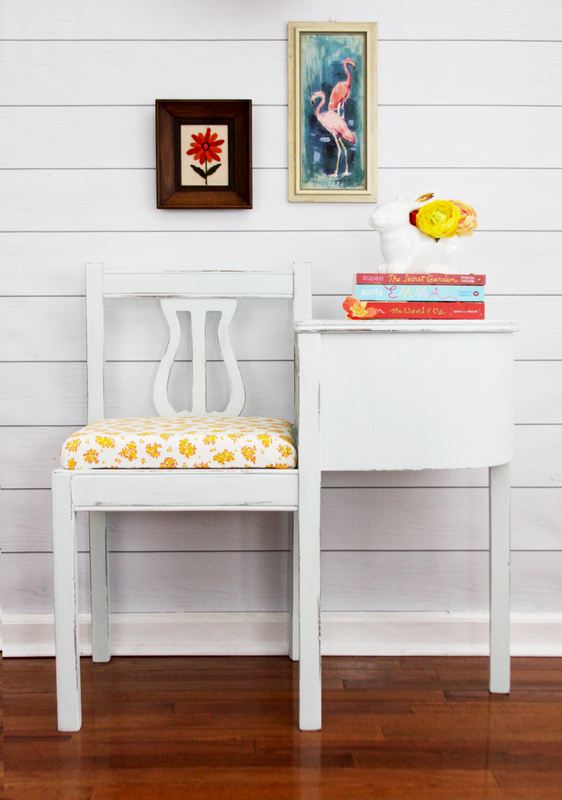 Definitely want to try out the new Milk Paint! Wow, this is adorable! By far, one of your cutest creations! I need one! Plus, I love the books that you chose to put on it. Did you make the covers? Thank you so much Kelly – I’m so glad you like it! 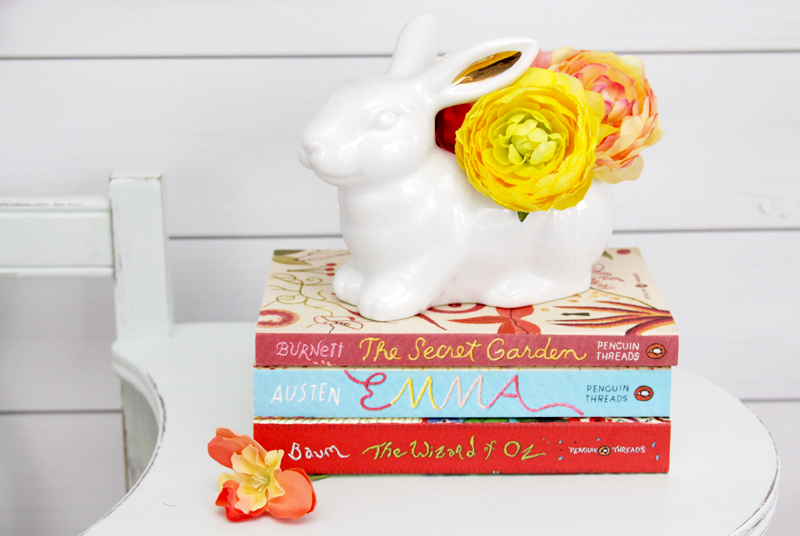 The books are some of my favorites! I didn’t make them – they are some of the Penguin Threads books. They have covers that were originally stitched, and they’ve made them into prints. They’re getting kind of hard to find now, though Amazon still has some. They are so pretty!! What a cool piece of furniture! And I absolutely love how you redid it and gave it such fresh new life! Great color choice too. It turned out so cute! Love the happy fabric you used! Thanks so much Kara!! I can’t resist those vintage fabrics!! It looks beautiful! I love the color you chose. I’ll have to try that one next! I never knew I needed a gossip bench before I saw this post! 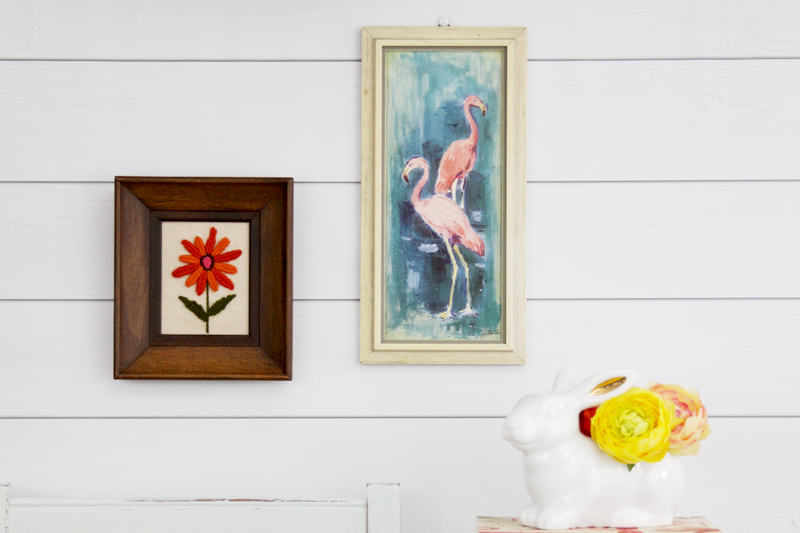 You picked the perfect colors of paint and fabric. Great job! This turned out great. When ever I see one of these it brings back memories. Way before the phones we have now. The gossip bench looks fantastic. Great makeover! I want a desk like that! If I come across one at an antique store, I will definitely have to get it, and paint it, too! Great work! This is just lovely. I’ve not heard them called Gossip benches before, what a fun name! When I was a kid we had something similar in our hallway with the telephone on it and called it the telephone table. One phone in the whole house, that makes me sound old! 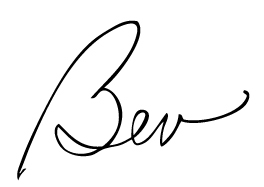 Bev! Your gossip bench turned out so pretty! What a sweet piece! 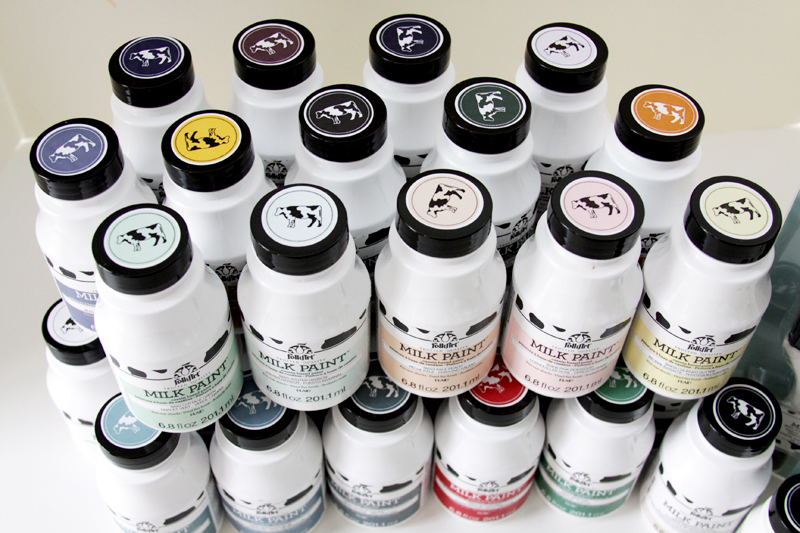 I haven’t heard of this type of milk paint before but I am going to look for it now! Thank you for sharing your thoughts on it! I would so love it if you would come share some of this inspiration at Making Broken Beautiful over at The Curator’s Collection! The party runs every Thursday thru Sunday and has just started. You do amazing work and I do hope you will come inspire! I hope you have an amazing day! This piece is so cute. I absolutely love it. 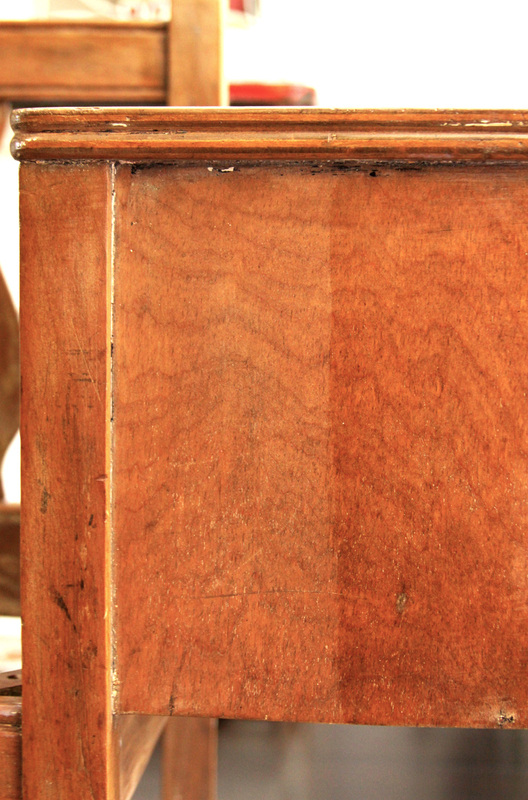 Thanks for sharing the step-by-step for refinishing. I have a bench we are going to refinish and add cushions. I got a few pointers that I am going to use. Connecting from 100 Happy Days and connecting on Pinterest. Have a great week! Wow…you did an amazing job! It looks so pretty! Thanks so much for sharing with us at Share The Wealth Sunday! Love your gossip bench makeover and the color is beautiful.Yo did a wonderful job. I finished a very similar one last summer…. 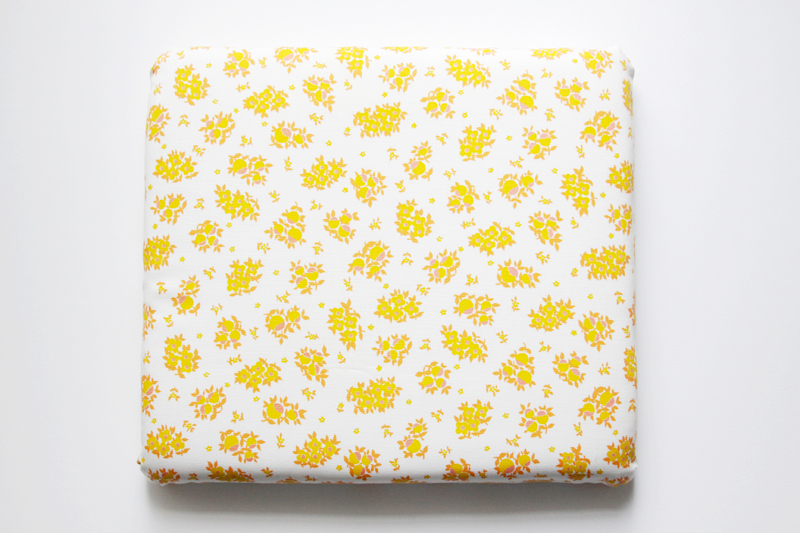 I just love the fresh white and patterned yellow fabric! I will be featuring it this coming week on Wonderful Wednesday’s Link Party….#OMHGWW!! Hi Bev, Someone in our family had my grandmas gossip bench. This makes me wish it was me. I love how it looks with the new painted look. Thanks for sharing at the Inspiration Spotlight party. Have a great week ahead. Pinned & shared. Turned out SO, SO, SO cute! You breathed new life into this – I never knew they were called gossip benches! Thanks for sharing with us at Throwback Thursday! This is just adorable! Visiting you via Moonlight and Mason Jars. I absolutely love your gossip bench makeover. I am on the prowl for one of these. Haven’t tried the milk paint yet. I’ll look for it. I really like the design of the container, reminds me of the old milk bottles. 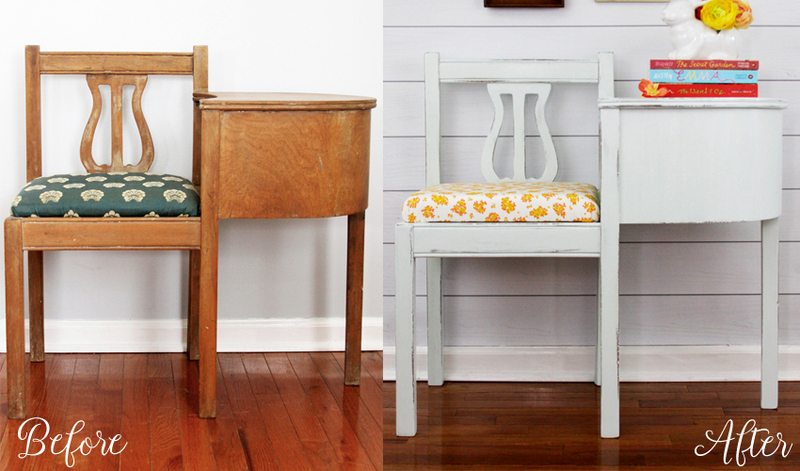 What a difference in the design once the bench and chair was refinished. It’s so cool that it keeps that rustic look.